Our family tradition of wrapping presents in fabric gift bags began as little brown paper bags. When my parents were first married in 1942, they lived in a basement apartment, the ceiling crisscrossed with pipes. For one of Mom’s birthdays, when Pop couldn’t afford much, he got her a bunch of little gifts, “Ning-A-Nings,” as we call them. He put them in little brown paper bags and hung them with string on the pipes. When Mom came home from work, she was greeted with all these little bags of surprises. She loved it! We had paper bag birthdays from that point on! As children, my brother Andrew and I would draw pictures on the bags or paste cutouts from construction paper, magazines, and old greetings cards. We made bags for special occasions — Mother’s Day, Easter, etc., and saved our favorite ones from year to year. Our mother Elizabeth hated to wrap presents, so eventually she wanted to convert Christmas to paper bags, too. Andrew and I resisted. To us kids, Christmas meant Christmas wrapping paper! So we compromised: we wrapped some presents in traditional gift wrap, and the rest we put in bags decorated with colorful Christmas cards, and glitter. We proved to be ahead of our time, because at some point, Hallmark stores and others began to offer their own paper bags printed with their own logos, Christmas themes, or fun graphics. (This was long before the commercially available, sturdier paper gift bags we can purchase today.) But we only allowed Christmas themed bags at our house. We also saved gift boxes of different sizes and covered them with Christmas paper, old cards, etc. The decorated paper bags and boxes could be used over and over and were saved from year to year. With the gifts under the tree in wrapping paper, the Christmas-y paper bags and the paper covered boxes, Christmas still looked festive. A reusable Christmas bag can replace holiday wrapping paper. Some time in my 20’s, Mom was pushing for the ease of all paper bags and boxes so she wouldn’t have to wrap anything ever again. (She would pass off her wrapping chore to her sons and husband so that we would wrap each other’s presents and she wouldn’t need to wrap anything!) But even as a grown up, I still wanted some Christmas paper…about that time, I began to notice Christmas fabrics. I decided to surprise Mom with cloth Christmas bags. A rectangle of fabric, folded in half and sewn to make a simple sack with an attached ribbon for tying it closed. They had the satisfying festive look of Christmas paper. They made gift-wrapping super simple and they were compact to store. Mom was thrilled! These cloth bags eventually edged out the paper Christmas bags, which eventually bit the dust, as well as most of the boxes, bulky to store. Some of these cloth bags we use every year are over 30 years old! 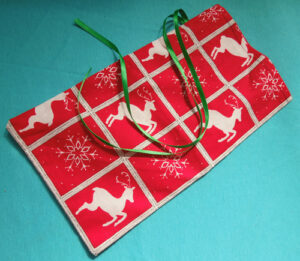 Now we all have collections of cloth Christmas bags, in different sizes to fit just about any gift. Over the years I’ve added bags in other fabrics for birthdays and holidays. As part of their gift, I make bags for some friends and family, who I know will use the bags and not just toss them away. Wrapping gifts in cloth gift bags couldn’t be simpler. It takes minutes to “wrap” a pile of presents. No need to buy wrapping paper. Haven’t bought any in years! How about you? How do you creatively wrap gifts without any waste? Michael Graham is a professional puppeteer and director of the Spring Valley Puppet Theater. 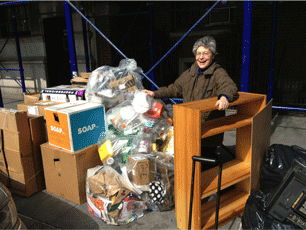 He grew up with the habit of recycling thanks to his mother Elizabeth and her volunteer work, which helped to establish one of the first town recycling centers in Connecticut. He has had a life long love of thrift shops, Goodwills, tag sales, and the reuse and savings they represent. I love this, Mike. I recently learned about furoshikis — Japanese wrapping cloths. I understand the Japanese government is trying to share the notion of furoshikis with the world as a contribution to sustainability! That’s interesting! There is a similar type of wrapping cloth in Korea, called a bojagi. When I spent a month in Korea last summer, I often saw them being used to carry small objects (such as lunch). They’re also pretty common for gift-giving. I’m not aware of the Korean government pushing any efforts to spread awareness about bojagi, but individuals who I met using them definitely supported the idea of re-using wrapping materials. Using cloth material for wrapping also makes for prettier gifts! As Michael’s pictures show, it’s fun to tie little bags with strings and beads. And it’s also so much easier to wrap non-boxed shaped gifts! I also love the idea of furoshikis. I’ve never used them, since I have made all these bags over the years. The furoshikis look beautiful and pretty easy to do, but still I think Mom would have gone for the ease and speed of the cloth bags. On a similar note. We have a wonderful vintage clothing store here in New Haven. I finally stopped in and had a great time poking about. I found a beautiful Hawaiian shirt. When the lady rang up my order, rather that putting the shirt in a paper or plastic bag, she pulled some squares of fabrics from under the counter. She took the square I chose, place the folded shirt in the center and tied the opposite corners together to form a pouch. A bamboo stick was passed through the knot so that one could carry the purchase home “country picnic lunch/hobo sack” style! A fun and festive idea for a vintage clothing shop! And the cotton polyester square I chose matched some delicate silk I has used on my Elf puppet from “Puss in Boots.” The silk had become torn and shredding. I was able to repair the Elf using that pouch fabric! On a return visit, I chose a beautifully patterned square for my purchase and then turned it into a new cloth bag for my collection! I also save wrapping paper. I started as a child, because I loved the beauty of the paper and wanted to use it to wrap new packages and make things. Favorite paper was used to cover gift boxes which could be used over and over. Some I still have! Now I carry a little exacto type knife to gift events and quickly slit the tape fast and unwrap the gift is about the same time would take to rip off the paper. The paper and ribbons can be reused, or used for projects. Small or ripped pieces are used for stocking stuffers. At the annual Three Kings Party, there is often much tissue paper used to fill gift boxes and paper gift bags. I ask everyone for their tissue paper if they are planning to toss it. I use some for future gifts where cloth bags aren’t the choice and the sorry pieces are used to make the confetti for the magical effects in my puppet shows. I collect a lot of paper each year and I end up buying very little bran new tissue paper for my performances! 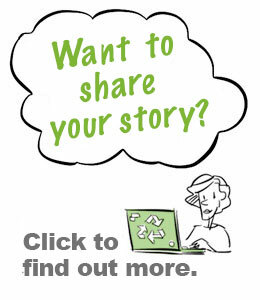 Love your stories about paper bags and wrapping paper. We are of the same mind on this. Glad you like the assignment of roles at the parties. It really works well and the friends are happy to be part of the whole process. PS. I really like your idea of assigning people the tasks of recording the gifts, collecting and smoothing out the paper. It is so easy to forget who gave what and having others do the “paper work” means the person getting the gifts doesn’t have to open presents and take the time to do all the saving and recording. Wonderful idea! Very cool; I have never understood this whole paper bag mania in the States anyway. Myself, I always keep the little jewelry bags when I get a new piece of jewelery: they make a really cute wrapping for small presents. You can also write a note on a piece of paper, add a sweet etc. The cloth jewelry bags would be great for gift bags! Our downstairs neighbor threw away two fancy cloth bags which must have come with shoes he purchased. Maroon velour with a logo. I’ll sew something holiday related, appliqué fashion, over the logo and get two new Christmas bags! Speaking of notes, I save many of the Christmas cards and other holiday cards I receive. Just took down my Christmas cards from all over the dining room and will go through them to see which ones I can use for other things. If not written on the back part of front of the card, I can cut the card in half and the front of the card can be used for sending a note, or if the right size, become a postcard. If there is a design I can cut out of the front of the card, I can used a hole punch and make a gift tag. Or past the design to a piece of paper for a note card. Or on a paper bag to make a gift bag. I like the creativity involved in reusing the cards and making new things out of them. Some are too beautiful and beg to be used again! Love the idea of repurposing shoe bags, Mike. Makes me think of some of the really fancy — velvet — bags I’ve received champagne and wine in over the years. They’d make gorgeous gift bags — ripe for repurposing! Thanks for the idea! This post brought back great childhood memories about my mom, so thank you for that Michael. 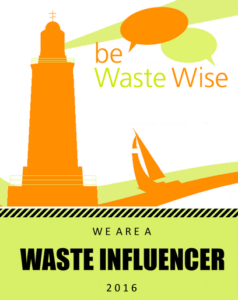 She was always looking for the best deals and the best ways to save, which made her a waste hater as well – whether she knew it or not. As a little girl, all my Indian outfits were made out of the leftover fabric from hers. Adorable mother-daughter pictures in matching outfits? Check. It’s amazing what you can do with some leftover fabric and a little imagination. Thanks for reminding us! What a good idea. I simply cannot wait to try this one out. AND it looks a lot more fun. I always feel bad with wrapping paper that is so pretty then gets ripped to shreds. This is a much more sustainable, personal way of wrapping a present. Muwhahahaha. Am going to have to share the idea with all my family and friends. 😀 Thanks for the article. It simply is a brilliant idea, but then the old ones usually are. This is great! I never thought about making my own reusable bags. Something I do at home is reuse newspaper to wrap birthday gifts. It gives the gift a really interesting and sharp look, while not creating any extra waste. My friends also like the personal touch of having the gift wrapped with the newspaper from their birthday. Glad you like the idea if cloth bags. We celebrated my brother Andrew’s birthday today. Each gift the three us gave to him was in a cloth bag. Wrapping all the gifts took minutes. And now I’m home and the bags are back in the “Bag Box,” ready for the next celebration. Newsprint is a great idea. The colorful comics section are prized for wrapping gifts. I often use newspapers when cloth bags aren’t as good an option. (Mailed gifts or when someone is the type of person who would just toss a handmade cloth bag.) Sometimes I get an mail order item and find it is packed in what looks like plain newsprint paper. A soft tan color. Love it for wrapping paper. I also save colorful magazine pages, (flowers, animals, scenes, etc.) and “last year’s” calendar photos, (similar themes) to wrap small gifts. I have my “cloth bag” box and another box for these found wrapping papers and saved wrapping paper from gifts others give me. Can’t recall the last time I had to purchase wrapping paper! My family has a similar tradition at my house. When my mother was little my grandpa used to try and save money and avoided purchasing wrapping paper. This meant at every family celebration he would wrap presents in newspaper funnies. It ended up being a wonderful way of getting presents and my family still continues the tradition to this day. It makes opening presents twice as much fun since it’s almost like your getting two presents. You get your gift and you also get to enjoy reading the funny pages afterwards. I remember each birthday opening presents would be an endeavor as you had to be very delicate with the newspaper wrapping or otherwise you might rip the comics. I really like your wrapping cloth idea though and I’ll have to look into it as a possibility for next Christmas as a new tradition for the family! I am the environmentalist in my circle of friends and I have been trying for years to get my girlfriends to resist the lure of virgin gift wrap and consider alternatives. We do a secret santa, so every year, the person assigned to me uses newspaper or reused wrapping paper/accessories and my gift recipient gets the same, but no one else does this for anyone else. It’s given the same consideration as something inconsequential, like a favorite color. But how do I to get through to them? How do I get them to change their behavior of their own accord (and NOT because I guilted them into it)? So I asked myself, what is it that people love about gift wrap? Anticipation is certainly a big factor. You want to make them excited by what’s inside but still conceal it fully, and maybe even throw them off. Also, some people may equate the presentation as a reflection of themselves (neat, durable, etc.) or if the gift will stay, say, under a tree for a while, then they may want it to play a part in their home decor. But basically, the prettier, the better for the recipient. Save any large paper that is a solid color, especially white, for your base. (I used to save sheets from those giant pads of paper that companies use for brainstorming because the back was always blank. Junk mail and magazines can have fold outs that are blank on the back. Even reused gift wrap is white on the reverse side and brown paper grocery bags are blank on the inside.) Presents wrapped in white or in kraft paper always look clean especially with cute emellishments like yarn, pinecones, cut-outs from old greeting cards, stamps (both the mailing kind and the ink pad variety), children’s drawings, cut-outs from photographs, small figurines, corks, pop tops, etc. Use the wrapping to give a hint of what’s inside. If you are giving a gift having to do with music, maybe you can use cassette tape film as “ribbon”. If it’s a scarf you knitted, yarn would be a great decorator. Similarly, collages are a great way to either hint at what the gift is or tailor the pictures you chose to the recipient. Old maps look very cool as gift wrap. Great for a travel theme! Best of all, use these tips to create a fun envelope and stick a gift certificate for an experiential gift–the best and most memorable kind! That’s what my brother did when he gave me sewing lessons as a present. We’ll learn how to make drawstring pouches soon, so I think I’ll be making quite a bit of cloth gift wrap in the weeks to come. Thanks for the post Michael! My family have not gotten to cloth bags yet, but we are very concious of saving as much of our gift wrapping materials as possible. Used wrapping paper that isn’t too ripped is either reused or cut into small pieces to used as gift tags. Bows and ribbons are reused (and much taped after the glue gives out). Gift bags are always reused and cards are cut up to use as more gift tags. Things can pretty much always be reused, and bags always means less tape- a blessing to a family with a tape-happy member. Like yours, my family and extended family also use homemade, reusable gift bags, especially around the holidays. My aunt started the trend in our family about 5 years ago when she made a set of fabric gift-wrap bags to use at Christmas. As my whole family sits around the living room and opens their gifts together, it is easy to return the gift-wrap bags after the presents are unwrapped. Since then, everyone else has hand-made, purchased, or gifted cloth gift-wrap bags with drawstring closures for holidays and special occasions within the family. Among the benefits to using them are: they are convenient—you can get several of them at once and you will always have a quick, convenient wrapping on hand, that is until they are all threadbare; they can be upcycled from old clothing and sheets; and almost everyone can make them. I also repurpose maps as more old-fashioned, paper gift-wrap. Last year, I rescued various color-coded, outdated maps of the state of Connecticut from my internship, where they were throwing them out by hundreds. The maps are large sheets of paper, which I often cut up and use as wrapping paper. They were especially helpful while I was away at school and had limited time to sew fabric gift-wrap bags. Although the map-wrap may not have the same longevity as reusable gift bags, I like to think that I am repurposing them before they make their way to the recycling bin. I love the idea of using old maps for wrapping paper. i have a few VERY old ones I could do something with. Just packed up a gift for my cousin’s wife to put in the mail. I used a page from a magazine as wrapping paper. An enlargement of cherry blossoms. Beautiful. Who needs wrapping paper! I’m glad Jacquie brought up the idea of Furushiki wrapping from Japan. 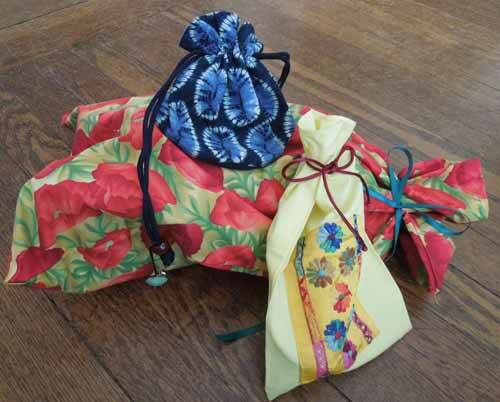 While I haven’t seen Furushiki before Googling it today, I have seen presents wrapped in Korea with cloth and I think it might look similar to the Furushiki wrapping: beautiful, classy and waste-free! If anyone is curious, this site has Korean-style cloth gift wrap for sale (bobowrap.com) and tons of interesting How To videos and posts. This post is especially helpful with the holidays right around the corner! I cannot tell you the number of times I have struggled with wrapping paper, trying to make gifts look perfectly wrapped require so much more time and trouble than it’s worth. Not to mention that those 15 minutes I spent taping every corner perfectly is undone in about 2 seconds by the gift receiver, what a waste! On christmas morning the piles of torn paper that populate my living room floor make for a lengthy clean-up and I’m always concerned my two dogs will get sick from eating the paper. Cloth bags are a wonderful alternative to wrapping paper. I love the idea of being able to reuse them year after year & how easily they can be collected and put back in their place after the holidays are over. I’m not sure if I have the sewing skills to make my own cloth bags, though I would love to give it a try. But I did a little research online and found this awesome website where you can buy them directly. They have a bag for every holiday! Of all the wasteful things we amass in our homes for very specific, single-use purposes, my least favorite has to be wrapping paper. As a thick, half bleached, half inked or laminated form of paper designed specifically to be ultra disposable, but usually not recyclable, wrapping paper is a gut wrenching expectation for the holiday-celebrating waste-hater. While some gifts for friends and loved ones are appropriately packaged in reusable gift bags, I used to come to the same tragic conclusion that I needed wrapping paper each and every December. Until I came up with a plan for its replacement. For the past couple of years, I’ve begun wrapping presents in recycled newspaper and magazine pages. One might think this option is not as aesthetically pleasing under the tree, but it can still look just as inviting as typical under-tree decor with use of unique ads, colorful pages, and bows. Not only is this a waste prevention and reduction tactic, but I’ve recently taken the idea one step further to personalize my recycled wrapping. For my mother, the librarian, I enjoy selecting book reviews to wrap her gifts in, while my father, the editor, gets articles and stories with obvious grammatical errors. A friend who works in fashion will receive her Christmas gift wrapped in ads for her favorite designers, and after a cousin moved to the New York Area her welcome presents were covered in playful maps from NY Mag. So if you’re looking for a way to replace this incredibly wasteful product with something unique and even personalized, might I suggest checking your recycling bin this holiday season! It’s an opportunity to keep wrapping paper out of the landfill and to wrap your gifts in a way that tells a very new kind of “A Christmas Story”. Kate, I was so inspired by this comment of yours, I wrapped all of my gifts in newspaper this year! There are so many colorful ads and pictures in the NYTimes these days, especially around the holidays, it was easy to find really pretty pages to wrap my gifts in. Macy’s especially ran so many ads with the word, “Believe” written out in script, that I simply designed the package so that word was emblazoned across the top. A great conversation starter too — everyone thought it was such a great idea. I suspect we’ll see many more newspaper wrapped gifts under the Ottman family tree next year — thanks to you! I really like your story about using cloth bags as gift wrap! What a great tradition. I’m a recent college graduate and I have always avoided using traditional wrapping paper by wrapping my gifts up in t-shirts. As a college student, it seems like I got a free t-shirt thrust into my hands every week. I never wore them, but I didn’t want to throw them away. I decided to use them to wrap up my presents instead. When my friends unwrapped their gifts, they enjoyed the double gift of the gift wrapping too! I told them that if they didn’t want to wear the shirt, they could always cut them up and use them as reusable rags! Love this idea! As the college penny pinchers that we are, my friends and I have only just ditched the communal snowman and snowflake decorated wrapping paper roll that resurfaced every birthday. In its stead, we’ve been using campus newspaper pages to wrap gifts. The t-shirt method sounds like a fun way to step up our recycled gift wrap… and to clean up my dresser! My family has been reusing the same collection of gift boxes and bows for as long as we’ve lived in this house (nearly a decade and a half). Nothing says surprise like a set of fuzzy Target pajamas packed into a bandaged, or “well loved,” Neiman Marcus box! This year I was sure to write “not Nike” across every swoosh before my sister got her hopes up. It’s exciting to come across some new ways to continue these recycled traditions! Rachelle, LOVE the idea of wrapping gifts in t-shirts. Yes, who doesn’t have an endless supply of them. Got me thinking… another thing I have an endless supply of is cloth tote bags. I get them at every conference and event. And need I say — they double as a carryall as well as a gift wrap! Thanks for this new idea. Perfect for youth in particular! When my siblings and I were children, my mother would save used wrapping paper and we would use it for arts and crafts – it was perfect! Now I try to come up with more creative ways to wrap gifts – I love the cloth idea! Most of the time, I just use whatever I have lying around like cardboard boxes or random bits of paper from my recycling bin, and will just embellish them with some artwork using markers. Most of the time, these wrapping methods actually wind up looking pretty cool and quirky, and become a part of the gift itself. After reading this post I am very excited to share this with my family for next holiday season. My family is always hosting the big Christmas Eve party and I am constantly looking for ways to spend time with my younger cousins, while also showing them ways to live more sustainably. I know that they love coloring, painting, glitter, etc. and I feel like making their own wrapping cloth would be a great time to teach them about how reducing and reusing can benefit their futures! I love this idea! My family, like yours, is always trying to cut down waste and save a little money during the holidays. Every year we save things like gift bags, wrapping paper, ribbons, and tissue, there are some bags I think might be older than I am! We also use things like newspaper and maps for wrapping paper or shopping bags for gift bags, but we have never used cloth as wrapping paper. Thank you for sharing this sweet family tradition, Mike! Nice post! I love wrapping gifts as well, but I tend to use paper I have from old magazines or something that’s just lying around the house. In India, re-using newspapers or giving out cloth bags is definitely the norm. My new favorite is this really interesting eco rice paper (ironic since it’s not made from rice) a friend got me from Japan. The paper, commonly known as ‘Xuan,’ is hand-made, so the ‘manufacturing’ process is sustainable as well. The texture is incredible… it’s very similar to cloth! Rani, the Xuan rice paper illustrates a great point: wrap those gifts with what you have based upon where you are! I love this idea for waste free wrapping! I tend to use old newspaper, particularly the comics section which is still colorful and fun like regular wrapping paper. As a few other commenters noted, maps also make great wrapping paper, particularly if there’s a special significance to the place you use. I love anything that has to do with Christmas, birthdays or other celebrations that include gifts so the title of your post had me hooked already! Thank you for the amazing tip of using cloth bags for wrapping gifts. I always hate to see huge piles of wrapping paper that end up being thrown out and I try to collect as much as I can and reuse it the next years either for gift wrapping or gift tags. I’ve also been creating my own Xmas tree ornaments with leftover gift wrapping paper, such as mini ornamental presents out of contact lens or medicine boxes and using hooks to hang them on the tree. This is probably my nostalgia speaking but I will say that one of the greatest joys of Xmas for a child is to rip the paper off a gift with sheer enthusiasm and excitement over what is underneath! So when I have children, I would love for them to experience that, in which case, I will use old magazines or newspapers laying around the house, while making sure that they are as aesthetically pleasing as possible. But I agree that for adults, cloth bags are the way to go to experience a more sustainable Xmas, birthday party, or other celebratory occasion. Thanks a lot for the wonderful festive post! As someone who is learning how to sew, I love the idea of Xmas cloth gift bags! I especially like the fact that they are used year after year and become a part of a family tradition – beautiful. I have been wrapping my gifts in newspaper for a long time but will definitely try cloth bags this year. Other excellent repurposed wrapping materials are brown paper bags (ask for and save them if you ever forget your tote bag when going shopping), tins, decorated glass jars, children’s artwork, and pretty flowerpots with the water catcher plate as a lid (which becomes a gift in itself). For decoration I love natural materials that you can find in your backyard, such as pinecones, leaves or pretty twigs. Besides repurposing old Xmas cards, another tip is to make your own cards. Old calendars are great for this as they have large pictures printed on sturdy paper. Either write directly on the back of the picture or glue it to a folded-over paper. If you staple the folded-over paper together and write the address on the other side, no envelope is needed! I absolutely LOVE this idea. So many times during the celebration of a holiday I found myself staring at the paper waste around me, but this is a great way to reduce the waste and still bring a festive flair though the fabric choice. Funny enough I recently saw bags for gift wrap selling for up to $45 that you could customize with the recipients name and several pattern choices so it appears this idea has even made its way to higher end markets. One thing I always try to do to help reduce waste is save all the boxes I collect over the year and then repurpose them for wrapping, I will definitely have to try the cloth bags this year though to add an extra layer to sustainability to the holidays! This is such a great idea. Growing up, we never wrapped presents for Christmas, they would just be sitting underneath the tree because my mom is also very conscious of waste. So I’ve never been too sentimentally attached to unwrapping presents. With my own gift wrapping, however, I’ve always been partial to reusing newspaper, wrapping paper and paper bags. But using cloth bags is a little extra gift all on it’s own! I’m definitely going to use this idea for my gift wrapping from here on out. I love this idea! For the past few years, I’ve been wrapping my gifts in old newspaper (just like some of you have already mentioned you do as well!). I’ve noticed that the general consensus online is that newspaper is aesthetically unappealing and a little drab, but I actually think that it’s a fun way to individualize your gifts for specific people, and make each present look unique, much in the same way that fabric bags can. For example, if I’m wrapping a gift for a friend that is really passionate about animals, I’ll make sure to wrap their gift in newspaper that prominently displays an article about an animal’s life saved! It’s a quick, eco-friendly, and personal way to make sure that all your friends and family still feel loved. I’m really excited to use cloth bags for the upcoming holiday season, but I’ll probably still use newsprint for my friends and family that live farther away. Love this idea! Christmas is already about buying more than you need, so why not cut back on a way that is still equally festive? The best part is, is that once these bags are made, assembling gifts would only take minutes. For my family, I know the gift wrapping experience can be long and draining. Would love to try this out, and perhaps over the years write notes on the cloth to add to the festivity! When I read this I had one of those “how have I not thought of this before? !” moments. Loved your story and I think this is a clever and fun idea to help reduce the waste of that pesky wrapping paper that always seems to trash the living room. One year I had a friend going away abroad and so I decided to wrap her gifts in old maps. My dad still has those books of maps that he used to keep in the back of his car. Of course, with GPS, they are virtually useless now. It was a great way to personalize my friends gift with travel themed wrapping without buying paper from the store and to be able to reuse something in my house that was no longer getting any use. I’m excited to try cloth bags this year for the holidays! This very much reminds me of 보자기 ‘bojagi’, which is a traditional Korean wrapping cloth. It is positively beautiful and, of course, positively reusable. Though I try my best to reuse gift wrap from the gifts I receive, inevitably most end up ripping apart. Because of this, I insist on wrapping gifts with paper I can find around my house instead of purchasing wrapping paper, namely newspaper. But cloth wrapping might just be my new holiday practice. In fact, how nice would it be if everyone used cloth bags and would continually trade around the cloth through re-gifting? If cloth wrapping was good enough for ancient gift wrapping, it’s good enough for me too! For anyone who would like to learn bojagi folding methods! Happy wrapping!